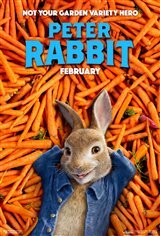 Mischievous bunny Peter (James Corden) and his sisters Flopsy (Margot Robbie), Mopsy (Elizabeth Debicki) and Cotton-tail (Daisy Ridley) have one goal in life — to get past mean old Mr. McGregor (Sam Neill) and help themselves to his garden, the one they believe is theirs because it's built on land their ancestors have inhabited for years. Luckily, not everyone is like Mr. McGregor — his next door neighbor, Bea (Rose Byrne), loves the bunnies and even lets them inside her house when it rains. When Mr. McGregor passes away, he leaves the house to his nephew, Tom (Domhnall Gleeson), who loves his job at Harrods in London. However, he decides to travel to the country for a short time to get the house ready in order to sell it. When Tom meets Bea, they develop a mutual attraction, but Peter doesn't approve, because this new Mr. McGregor is, in his eyes, as mean as the old one.